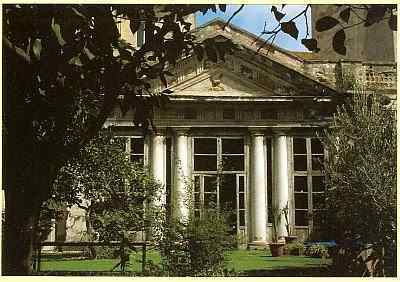 The original premises were the property of the Sanseverino family, one of the most powerful feudal families in the Middle Ages in the Kingdom of Naples. They were involved, however, in disputes with central royal authority and the building was confiscated by King Ladislao and given to the Republic of Venice in 1412 as a residence for the Venetian consul in Naples. (The building was, in fact, called Palazzo San Marco for a while in honor of Venice). The premises originally included adjacent property on both sides—that is, on the east towards San Domenico Maggiore as well as on the west, now the Palazzo Filomarino (and Benedetto Croce’s residence for many years). It says: "Pietro Dolce, for the Most Serene Republic of Naples, on the order of the same, while residing here restored the part of this house that was destroyed. AD 1646." The year 1646 is what I noticed—that in conjunction to the reference to the Most Serene Republic of Naples! In Italian, la Serenissima has always meant Venice, la Serenissima Repubblica di Venezia. I think San Marino also still calls itself Most Serene, but other than that, the only time I have run across the expression is in reference to Naples in conjunction with the very short-lived Republic of 1647 (when it was actually called the Most Serene Royal Republic.) At first I thought I had remembered the Masaniello date of 1647 incorrectly; maybe it was 1646 and Pietro Dolce (Sweet Peter!) had restored some stuff destroyed by cannon-shot and roving rebels; alas, 1647 is the correct date for Masaniello, so I guess the use of Most Serene for Naples was just Pete's way of paying some sort of tribute to his hosts at the Palazzo Venezia. The last dispatches, written by the last Venetian diplomat in Naples, Pietro Busenello, acknowledged in 1797 that the Serenissima Repubblica di Venezia had come to an end (the city-state was taken by Napoleon in that year) and thus, sadly, that his services and those of the Palazzo Venezia were no longer needed. After the fall of Bonaparte, an inscription from 1816 records the acquisition of the property by a Neapolitan jurist, Gaspare Capone. These days the Palazzo Venezia serves as cultural venue for art shows, exhibitions, lectures and musical productions, generally focused on characteristically Neapolitan themes.